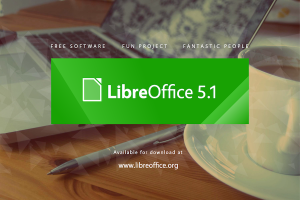 Berlin, May 12, 2016 – The Document Foundation (TDF) announces LibreOffice 5.1.3, the third minor release of the LibreOffice 5.1 family, supporting Google Drive remote connectivity on GNU/Linux and MacOS X.
LibreOffice 5.1.3 is targeted at technology enthusiasts, early adopters and power users. For more conservative users, and for enterprise deployments, TDF suggests the “still” version: LibreOffice 5.0.6. For enterprise deployments, The Document Foundation suggests the backing of professional support by certified people (a list is available at: http://www.libreoffice.org/get-help/professional-support/). People interested in technical details about the release can access the change log here: https://wiki.documentfoundation.org/Releases/5.1.3/RC1 (fixed in RC1) and https://wiki.documentfoundation.org/Releases/5.1.3/RC2 (fixed in RC2). Details of Call for Papers, open until July 15, 2016, are available at: https://blog.documentfoundation.org/blog/2016/04/08/libreoffice-brno-conference-call-for-paper/. Registration for the conference is open at: http://conference.libreoffice.org/2016/registration/.